Cologne - TSG 1899 Hoffenheim have never beaten FC Bayern München in their 13 attempts to date, so when the Sinsheim outfit host the Bundesliga record titleholders on Saturday afternoon, the home side will be relying on one man in particular as they seek a maiden triumph: . Speaking exclusively to bundesliga.com as part of our Interview of the Week series, the 22-year-old gives his thought's on the upcoming match, outlines Hoffenheim's hopes for the season and analyses his prospects on the international stage. bundesliga.com: Kevin Volland, is now a good time to be playing Bayern? Kevin Volland: I think so. We can be dangerous if we play at a fast pace. Bayern lost an important match in Porto and they might have the return leg in the back of their minds. bundesliga.com: So Hoffenheim have a good chance of beating Bayern for the first time ever? Volland: I’m convinced we can beat them but in order to do so everything will need to come together for us on Saturday. bundesliga.com: Bayern conceded all three goals in Porto as a result of individual mistakes. As an attacker, will you be gambling on their defenders being unsettled? Volland: Bayern’s players are so good that the errors like the ones they made in Porto don’t happen in every game. It’s going to be an extremely difficult match as Bayern have so much quality. We’ll have to be at our very best. Volland: When you lose then it’s normal that you’re frustrated, but I’m the kind of person who quickly moves on from a bad result and focuses on the next task. bundesliga.com: Hoffenheim nevertheless have a good chance of qualifying for the UEFA Europa League for the first time. How important would it be for the club to play in Europe? Volland: It would be something very special for the club and the players. We haven’t had a great second half of the season but we could still make it into the top six or stay in seventh at the very least. bundesliga.com: Who are Hoffenheim’s main rivals for a place in Europe? Volland: There are several teams below us who are trying to climb the table and it’s really tight above us too. Everyone’s still got a chance because, just like us, other teams have dropped a lot of points. In the race for Europe we’re only focusing on ourselves, though. bundesliga.com: Would you bet on Hoffenheim making it? Volland: We’ll do everything we can to go as far as we can this season. bundesliga.com: Borussia Dortmund are among the challengers. How will Jürgen Klopp’s decision to step down affect the team? Volland: Jürgen Klopp will keep working right to the very end. Dortmund have so much quality and can certainly still finish in sixth. The race for the Europa League places will go right down to the final day of the season. bundesliga.com: Do you see yourself staying at Hoffenheim in the long-term? Volland: I’ve got a contract until 2017 and I really like it here. I haven’t given any thought to anything else. There’s so much at stake in the league at the moment that nothing else matters for me right now. bundesliga.com: Does the fact that coach Markus Gisdol has extended his contract affect your decision? 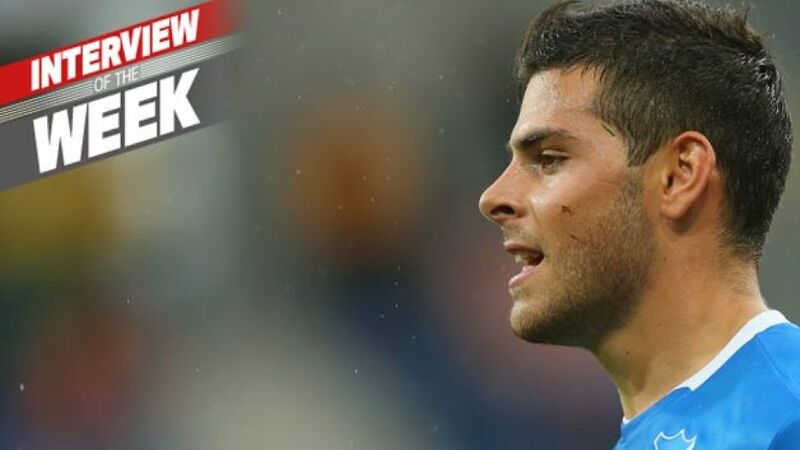 Volland: He’s the most important figure at the club. The coach has built something here and I’m convinced that he can still achieve a lot here. bundesliga.com: You once said that “a lot of teams don’t like to play against us because we’re an awkward opponent”. Could you explain what you mean by that? Volland: That was based on the assumption that we manage to play our game for the entire 90 minutes. We have to do that because if we play as we’re capable of playing, it’s difficult against us. We’re a counterattacking team and punish our opponents’ mistakes. bundesliga.com: Why have Hoffenheim been inconsistent of late? Volland: Against Dortmund [in the DFB Cup] we knew that we needed to produce a big performance and we played with confidence, but then in our next game against Köln we were poor. That shouldn’t happen. Every player needs to reflect on whether they did their best. bundesliga.com: The partnership between Roberto Firmino and yourself is one of the most feared in the Bundesliga. How enjoyable is it to play alongside him? Volland: If you’ve got a player as outstanding as Firmino in the team then of course you look to play with him a lot. We have a lot of fun together, but we’ve also got a lot of other good players in the team who it’s fun to play with. bundesliga.com: What is your relationship like away from the pitch? Volland: Roberto recently became a father so we don’t meet up as often now. There’s a good team spirit in the squad and we regularly do things together. We also have team evenings that everyone takes part in. Volland: I think I’ve taken a step forwards since the turn of the year and now I make my presence felt more out on the pitch. I want to keep developing and for an attacker to do that you have to take shots and not only tee up your team-mates. My game is essentially still the same but in certain situations perhaps I’ve become a bit greedier. bundesliga.com: Gisdol believes that you’ll become a mainstay in the German national team after the U-21 European Championship in the summer. Is he right? Volland: That’ll depend on my performances in the Bundesliga. I’m delighted about every call-up I get but you only earn it if you play well for your club. It all depends on me. bundesliga.com: Can Germany win the U-21 European Championship? Volland: We’ve got a good chance of winning the title. However, our warm-up matches against Italy and England showed that we’ve still got a lot of work to do. bundesliga.com: Are they the main rivals for the title? Volland: Serbia and Portugal also have good teams, as do some of the so-called smaller nations like Denmark. As hosts, Czech Republic also have a good chance. It won’t be an easy tournament.